Last year's Premier League runners-up are in need of a positive result against Mick McCarthy's men after back-to-back home defeats as well as a 2-1 away loss to Bayer Leverkusen. While the loss to QPR was hailed as a tactical masterclass by the manager and a spirited performance by the 9 men on the field, the defeat to Arsenal at home was nothing short of shambolic, considering the manner in which the defence self-destructed. Then Liverpool did something that Chelsea sides of the past were well accustomed to – taking all the spoils from a evenly-contested game. Andre Villas-Boas will have plenty to think about in terms of who keeps their place following a poor run of form, but wholesale changes probably won’t occur against Wolves. There will probably be minor tweaks, with Fernando Torres possibly coming in to replace Didier Drogba ,who scored in the defeat to Bayer Leverkusen, though there could be some young players filling in for tired legs after two long games in one week. Ashley Cole has been passed fit. The England left-back missed Wednesday night's Champions League defeat with an inflamed ankle but has shaken off the problem. 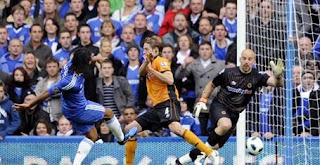 Long-term knee injury victim Michael Essien is therefore Chelsea's only absentee. For Wolves, Richard Stearman looks set to miss out with a broken wrist, and Ronald Zubar could fill in for his first appearance in nine months, while both Jamie O'Hara and Stephen Hunt are both missing due to suspension. Expect Nenad Milijas and Adlene Guedioura to step in.